The semiannual Maison et Objet interior design and furniture fair has once again reigned down on the city of Paris with a plethora of inspiring, innovative and beautiful design creations! Love Happens had the great pleasure of visiting Maison et Objet 2019 and here are the luxury home decor creations we fell in love with! Love happened for us hard and fast when we came across the French contemporary artist Juliette Clovis. 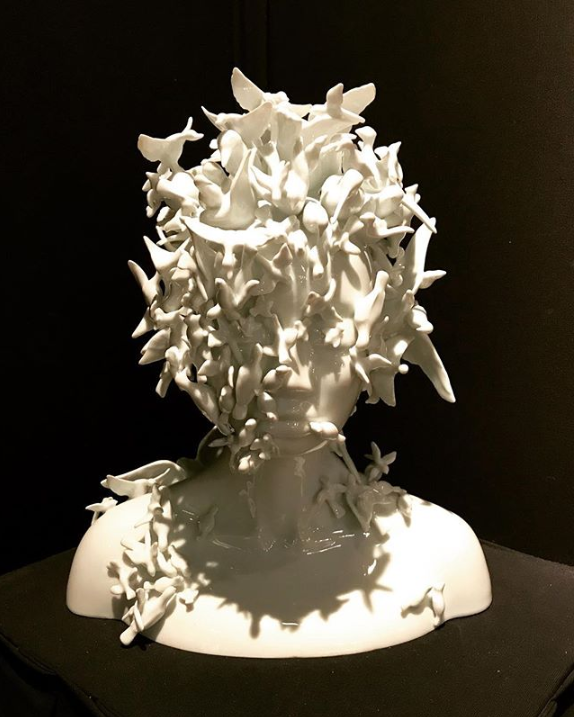 Her Limoges Porcelain sculptures are absolutely magnificent! Pure creative genius at work! Adored US luxury home decor brand KOKET stole the show at Maison et Objet 2019 with its stunning designs! The stand featured four beautiful window displays each showcasing a unique KOKET vibe. From the Asian inspired Gucci wallpaper to the original dress from the cover of the 3rd volume of Love Happens print edition (launched at the show), visitors were lured into KOKET’s world of glamour. The Divine cabinet by KOKET was a magnet for passerby’s with its natural feather covered doors! The custom red moire dress from the cover of Love Happens Volume 3 wowed in the window dedicated to the issues launch! Meanwhile inside the stand one was surrounded by the alluring magical world of KOKET! A longtime favorite of Love Happens, Circu shined yet again with its truly magical children’s furniture! Oh to be a child with a room like this! Prior to the show, I happened across one of ibride’s gorgeous fringed tables so I was thrilled to see their amazing creations live! Love, love, love! We once again fell in love with Serip’s organic sculptural lighting masterpieces! Love Happens instantly fell in love with Bessa! The Portuguese luxury home decor brand showcased beautiful and creative designs – truly art as furniture! Each piece in Bessa’s collection takes inspiration from stories from the past. Located inside the always beautiful Covet House was a special project dedicated to craftsmanship. Project CULTURE was created by the Covet Foundation, a non-profit in support of craftsmanship in design. The project brings together master artisans and designers who work in a variety of materials to create new and inspiring masterpieces. At Maison et Objet the CULTURE project exhibited a set of exquisite stools brought to life thanks to talented hands and ancient techniques. The creators pushed the limits of arts and crafts. The result, masterpieces reflecting their makers souls, a tribute to handcraftsmanship, cultural heritage and legacy. CULTURE will continue to create such Limited Edition Series continuing their plight to enrich the artist’s signature. Lh can’t wait to see what they do next! The ultra creative Rug Society wowed us again with their gorgeous designs! 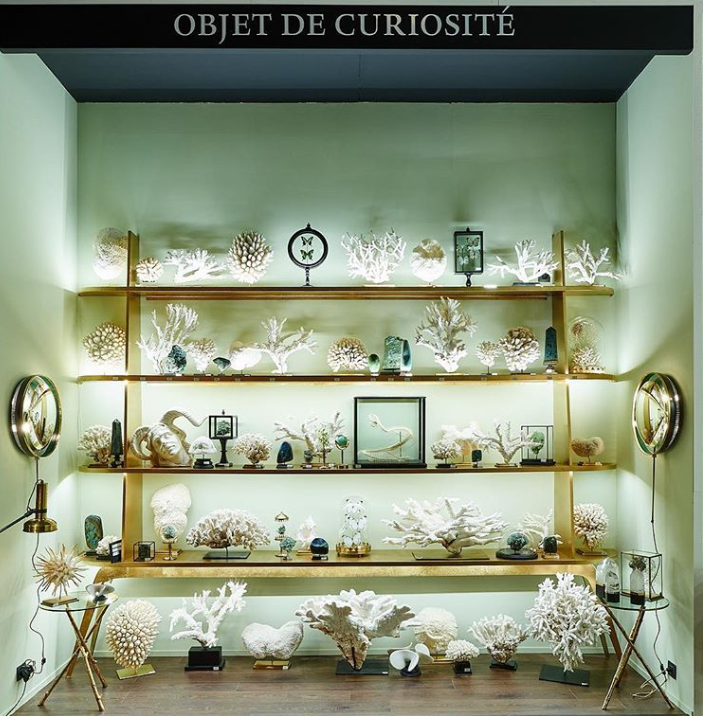 Always a favorite, Objet de Curiosité once again inspired and delighted us with their stand filled with endless eye candy! White coral and green mineral wall! Although their stand was small the possibilities were infinite! Creators of museum quality bespoke furniture and wall panels. Masters in wood, metal, stone, and other luxury materials. And experts in straw marquetry, gypse (selenite or gypsum), parchment (vellum), mica, pyrite, and shagreen (galuchat), as well as precious wood veneers and fine metalwork.